Isuzu D-max factory wiring/13 pin plug/split charging relay. 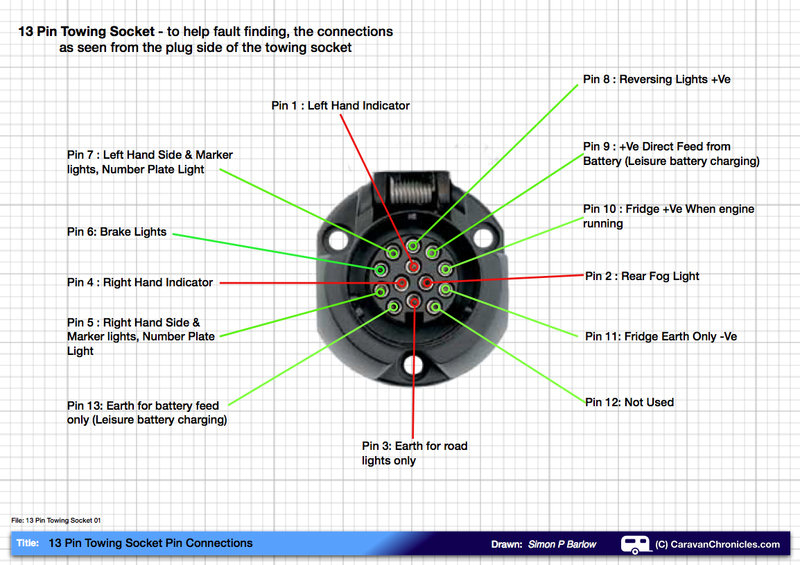 Hi folks, having never towed a trailer or caravan before I've never had to look into these towing connectors or wiring, can anyone confirm that my thoughts/findings are correct so far? My D-max has the Euro 13 pin towing socket already fitted, from my own testing, pin no.9 (leisure battery charging) is constantly live all the time, now if I plugged in a caravan/camper unit isn't there a possibility of draining the trucks battery whilst stationary overnight etc? I've tested pin no.10 (fridge charging) and that is only live when the engine is running, now that makes sense to me,...I just wonder why Isuzu didn't wire pin no.9 to operate in the same way. OK, so I have since bought a voltage sensing relay, I gather that is the best thing to fit anyhow, how have you guys wired them into the towing loom? Now do I run just one wire along the whole length of the truck, to where the towing connector is actually situated and cut/wire it to pin no.9 or is there a more suitable place to splice into closer to the engine bay for example?? Here's links to the connector and relay I have. Before you connect that up, have you got a camper yet? You may find that this is all built-in to the camper wiring, and there is not a possibility of discharging the truck battery. Toshbins wrote: Before you connect that up, have you got a camper yet? No, I haven't got the camper yet. 'Should' be the case there isn't any possibility with ignition off of truck that power isn't available, and with key on it only appears when a small relay after the alternator diverts power away from a fully charged starter battery to camper's leisure battery instead. with it working and camper hooked up and fridge switched to 12v, mine doesn't indicate its working for several minutes after engine is started quite often and the starter battery replenished after the effort. is there a caravan locally you can hook up too and see what happens? I thought that there may have been a relay/timer within the factory wiring but it appears not, that pin is still live even hours after the ignition key had been removed. I don't know anyone with a caravan nearby. earthman wrote: I thought that there may have been a relay/timer within the factory wiring but it appears not, that pin is still live even hours after the ignition key had been removed. earthman i think youre right that there 'should' be AFaik it should be dead with key turned off period. Hmm, so are you saying that some vehicles are fitted with such a relay whilst they are on the production line?? If so my one must be stuck on the 'on' position then?? I were passing an Isuzu dealership yesterday so I popped in and asked to speak to a mechanic about this subject, he said that pin no.9 being constantly live is normal on modern vehicles, it is certainly like that on the wiring loom for Land Rover's for example he said. From his understanding, any caravan/camper unit made from around the year 2000 he thinks should have the voltage sensing ability within the camping unit, close to the leisure battery/fridge end, when the leisure battery is full that live feed is then switched off. If all this is correct, I've just had a thought,....what if you were to connect up your towing plug to an already half depleted leisure battery (because it had been stood over Winter for example) and not drive off promptly, wouldn't the trucks battery be drained over a couple of hours/during a night maybe? Something to think about if you do happen to get hitched up, ready to drive away early the next day. I'm wondering how many owners have paid to have a relay fitted up front to the vehicles battery when in fact there's been no need to do it.